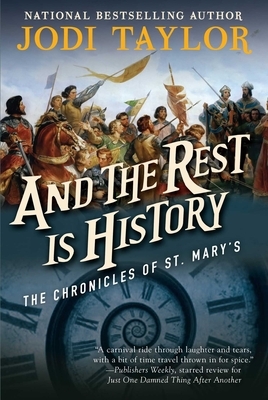 The Chronicles of St. Mary’s tells the chaotic adventures of Madeleine Maxwell and her compatriotsDirector Bairstow, Leon Chief” Farrell, Mr. Markham, and many moreas they travel through time, saving St. Mary’s Institute (too often by the very seat of their pants) and thwarting time-travelling terrorists, all the while leaving plenty of time for tea. She’s no safer at St. Mary’s. Tragedy strikesnot once, but several timesand with no Leon, no Markham, and no Peterson at her side, Max’s personal life slowly begins to unravel. From the Egyptian desert to the Battle of Hastings, and from Bayeux Cathedral to the Sack of Constantinople, Max must race through time to save the ones she loves. Jodi Taylor is, and always has been, a history nut. Her Chronicles of St. Mary’s, a wild mix of history, adventure, comedy, romance, tragedy, and anything else the author could think of, began as a self-published book entitled Just One Damned Thing After Another. It’s now a bestselling, wildly addictive series.